The two base Mac mini models vary in only three ways: processor speed, hard drive size, and price. For $499 you get a 1.25GHz G4 processor and a 40GB drive; for $599 you get a 1.42GHz G4 processor and an 80GB drive. That means that a $499 computer can become a $1,203 computer very quickly, and a $599 computer can escalate to a $1,253 machine just as fast—and all without keyboard, mouse, or display, mind you. Yes, the Mac mini is small. It’s so small that you would have to stack five of them to equal the volume of the Power Mac G4 Cube, a system which sure seemed amazingly small at the time. 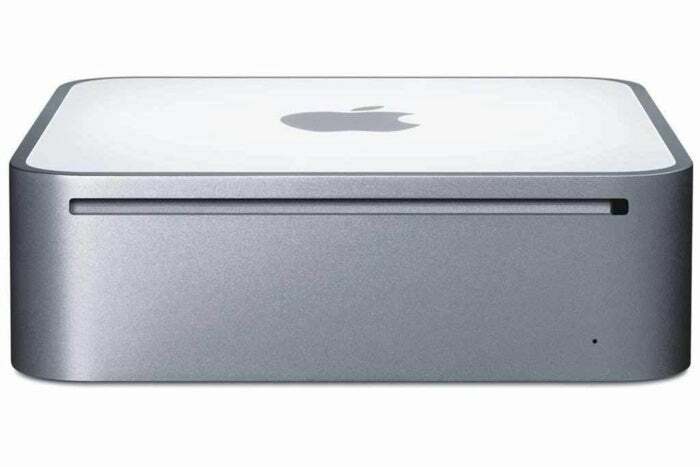 The Mac mini could be smaller, we suppose, but only if you did away with the optical drive. Since there seems to be no end to the reign of five-inch CD and DVD platters, this will probably be the smallest Mac for a good long while. The Mac mini’s diminutive motherboard is exactly the width of its RAM slot. That’s because the Mac mini uses full-size PC2700 RAM. Apple could have saved some space by using laptop RAM, but it wouldn’t have helped much, given the size of that pesky optical drive. 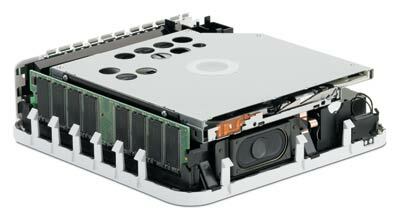 However, the Mac mini’s hard drive is the same kind you’d find in a laptop: it’s a 2.5-inch, 4200 rpm drive. The Mac mini uses materials we’ve all come to expect from Apple’s latest designs: its top is a white polycarbonate plastic, as you’d find on the iMac G5 or iBook; the sides are a ring of anodized aluminum, just like a PowerBook or iPod mini; and the bottom is the skid-resistant rubbery material you’ll find on the bottom of an iPod dock. The most widely criticized aspect of the Mac mini is its meager base 256MB of RAM. However, the RAM slot on the Mac mini seems to be pretty accessible; if it turns out to be fairly easy to crack a Mac mini open, it seems that more RAM would be the easiest thing to install. Keep in mind there’s only a single RAM slot, so if you want to upgrade your RAM after buying a Mac mini, you’ll need to yank the pre-installed module first. Despite Steve Jobs’ lack of discussion of the Mac mini’s wireless capabilities at the Macworld Expo Keynote, the Mac mini can do wireless. Due to the tight spaces within the Mac mini, both the AirPort Extreme card and Bluetooth module attach to the Mac mini’s motherboard via a special connector. Since we haven’t had a chance to open up a Mac mini (although we did get to handle a bare motherboard), we’re not sure if that connector is included on all models, or only ones that have had AirPort or Bluetooth pre-installed. As a result, we’re not sure if adventurous types could buy an AirPort Extreme card and install it in a Mac mini themselves. Apple doesn’t recommend it, however—they suggest that you have upgrades performed by an authorized Apple service professional. In previous Mac models, internal Bluetooth support has been an option that’s available only when you order the machine: if you don’t opt for internal Bluetooth, you can never add it later. But that’s not the case with the Mac mini: the Bluetooth module attaches to the same special connector coming off the motherboard. According to Apple, this means you’ll be able to have an authorized dealer install the internal Bluetooth module later if you don’t feel that you need it right away. True to Apple’s recent hardware-design history, the Mac mini has an independently-controlled fan that turns on and off and adjusts its speed based on the Mac mini’s cooling needs. According to Apple, the fan runs at 22 decibels, essentially whisper-quiet. We had a hard time hearing any noise coming from the Mac mini’s fan, but then, no room at Macworld Expo is quiet in the way that a truly quiet home or office setting would be. We’ll have more on the Mac mini’s noise when we get one into the Macworld Lab. On the back of the Mac Mini there’s a DVI connector; if you need to use a VGA display, the computer comes with a small plastic DVI-to-VGA adapter block. (If you want to connect to a TV via RCA or S-Video cables, you’ll need to buy a $19 adapter.) Also on the back is a 10/100 Base-T ethernet jack, a 56K modem, two USB 2.0 ports, a single FireWire 400 port, and an audio-out jack that can handle both line-out and headphone-out levels (yes, there’s also an internal speaker). Above the ports are a series of air vents, straddled by the power button and a Kensington-style security slot. Of course Macworld will bring you more in-depth coverage of the Mac mini once we get a few of our own, including reviews, lab reports, and the rest. And in the coming weeks we’ll no doubt be seeing an avalanche of Mac mini-related products. Anyone want to bet how many days it’ll be before the first company announces a mini-styled external FireWire hard drive that’s designed to sit right beneath the Mac mini? If the industriousness of the Mac market is any indication, it won’t be a very large number.